Posted 11:22 pm by Jonny Pigg & filed under Gig. Saltburn’s social justice party starter’s return to deliver another fantastic event this March. 4 people not profit present a night supporting Nepal’s Gandharba Cultural Art Organization. The event will be on the 16th of March at the Spa hotel, starting at 8.00pm till late. After travelling to Nepal Justin co organiser of 4 People not profit met with members of the Gandharba street musician community in Katmandu. The Gandharba people are the musician caste of Nepal and are stigmatized and discriminated against as the dalit (untouchable caste of the country). They are a very poor people with minimal opportunities in there society and make a living doing small street gigs and selling there instruments and C.D’s to help pay to provide education and skills to there under privileged children. After speaking to the Suresh the leader of the Gandharba cultural art organization, it was highlighted that what they really needed was a website for them to advertise there gigs, and to sell there C.D’s and instruments to a wider audience. Therefore the idea was born to arrange a 4 people not profit gig to raise money to support the Ganharba people by paying for this. For this event we have very special guests, the nationally renowned festival destroying dub reggae soundsystem Instruments of Jah. 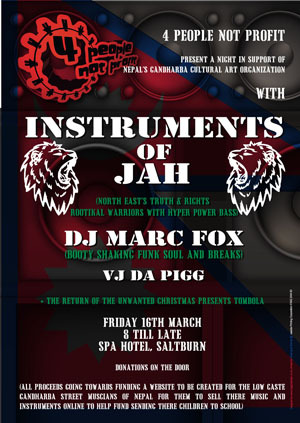 As they describe themselves the North east’s truth & rights rootikal warriors with hyper power bass. Joining them will be our resident DJ Marc Fox who will be playing funk, soul, breaks and beats, and VJ artistic wizardry from Da Pigg. The event is free except for donations on the door, where all proceeds will go towards paying for the Ganharba Cultural Art Organization’s website to be designed and built. The night will also mark the return of the Unwanted Christmas presents tombola. This will be a storming event and one not to be missed. So tell all your friends and family and get down and don’t forget to bring your dancing shoes and get ready to boogie at Saltburn’s first big party of the year.